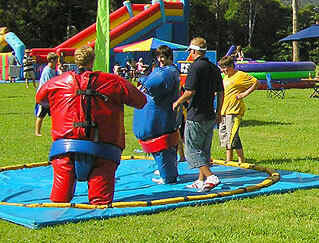 Engage in the "Ceremonial Bowing", Sumo stance and a lot of grunting and groaning as you Wrestle one on one to win and perform the "Grand Sumo Slam" on your opponent. The rules are simple. The last Sumo standing when all of the laugher has stopped is the winner. Make your bookings to hire a Sumo Wrestling Suit for your next party now! Their popular.